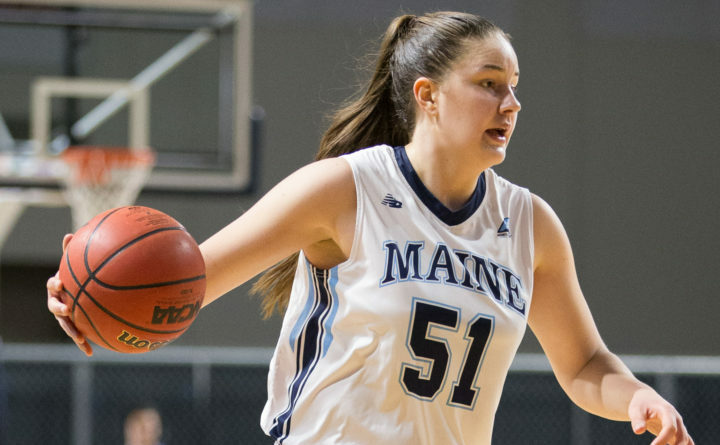 UMaine forward Fanny Wadling, seen here in a university file photo, scored 16 points and pulled down 11 rebounds to help the Black Bears defeat Bryant University Tuesday night in Rhode Island. It was not long ago that University of Maine junior Fanny Wadling sat in a dark room in her apartment to combat dizziness, nausea and vision problems. The symptoms resulted from a concussion she suffered when she took an elbow to the jaw in the Black Bears’ 66-63 loss to Duke on Nov. 15. She finished the game but did not feel well the next day. Several weeks later, the 6-foot-2 forward is just happy to be back in the lineup after missing 10 games. She is still working herself back into game shape. Fanny Wadling (left) of the University of Maine defends against a University of Hartford player during the 2018 America East women's basketball championship game in Bangor. The junior forward has returned to action after missing 10 games with post-concussion symptoms. 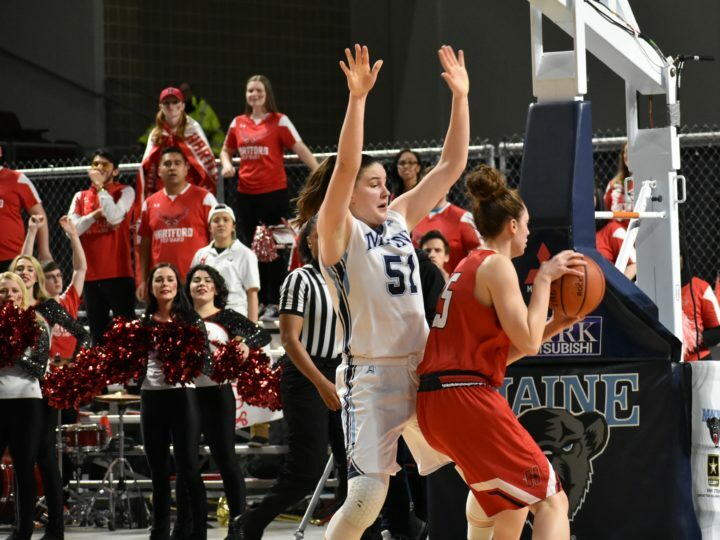 At the time of the injury, Wadling was UMaine’s leader in rebounds (8.7 per game) and blocked shots (1.7), and was averaging 11 points per game. She is glad that her symptoms finally subsided. “I didn’t feel good at all,” said Wadling, who returned to the lineup for last Wednesday’s 67-46 win over New Hampshire and had a more productive outing in Saturday’s 84-44 victory over the University of Maryland-Baltimore County. “I’m still working on the conditioning and the strength I lost. It’s getting better. I’m happy to be back,” the native of Nacka, Sweden, said Monday. She said her recovery was frustrating. “I plateaued for a while. I felt the same every day. Everyone kept asking me how I was doing and when I was coming back,” Wadling said. “It’s not fun. I wouldn’t recommend it,” she said. She credited UMaine head athletic trainer Ryan Taylor with playing an important role in her recovery. “Every concussion is different. She struggled to feel better. She wasn’t able to do anything for a while,” said Taylor, who was following concussion protocol. Taylor and team doctor Ken Trubey devised a plan to help get her back on the court. The pool workouts included head movement exercises underwater, he added. “The pool workouts were long. You’re alone in the water and there’s no music,” she said. Wadling also said she did some work on the stationary bike, and eventually did some shooting and rebounding with Taylor while the team was away on road trips. “Nothing compares with being on the court,” said Wadling, who averaged 6.4 points and 5.6 rebounds last season. She was the America East champion Black Bears’ second-leading rebounder and No. 4 scorer last season. “He was testing things like my shooting, running and going up for rebounds,” Wadling said. She went through two noncontact practices with the team right before the Fordham Holiday Classic Dec. 29 and 30 in New York and began practicing with contact the following week. Wadling was cleared to play the day of the UNH game. Wadling, who missed two weeks with a concussion her freshman year at UMaine, posted four points, three rebounds, two steals, two assists and a blocked shot in 21 minutes against UNH, and had nine points, six rebounds, four assists and one steal in 19 minutes against UMBC. “She is a difference-maker for them. She plays her role really well,” UMBC assistant coach Carlee Dewey said. Wadling, who is averaging 9.2 points, 7.0 rebounds and 2.4 assists, will be on the court for Wednesday’s game at Vermont.